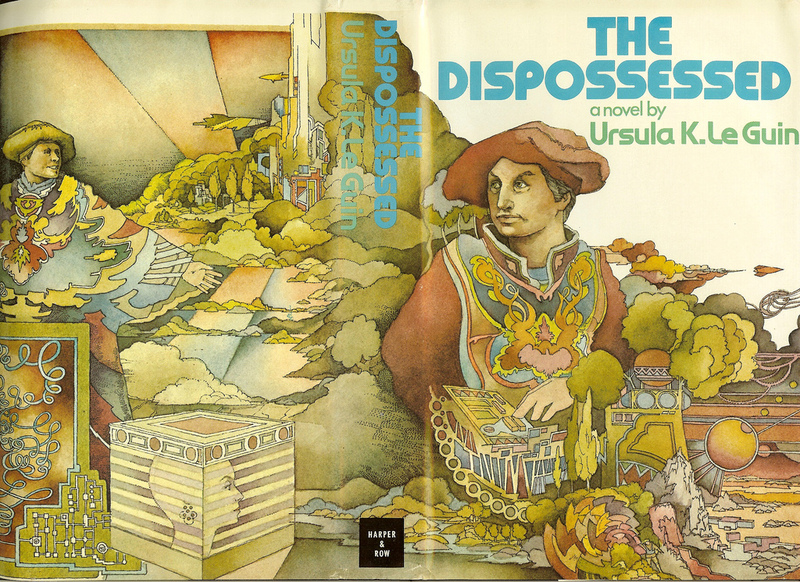 Fred Winkowski’s jacket design for the first American edition of The Dispossessed, Harper & Row, 1974. More of Winkowski’s artwork can be seen at his website Moons, Machines, and Martians. Odonianism is anarchism. Not the bomb-in-the-pocket stuff, which is terrorism, whatever name it tries to dignify itself with; not the social-Darwinist economic “libertarianism” of the far right; but anarchism as prefigured in early Taoist thought, and expounded by Shelley and Kropotkin, Goldman and Goodman. Anarchism’s principal target is the authoritarian State (capitalist or socialist); its principal moral-practical theme is cooperation (solidarity, mutual aid). It is the most idealistic, and to me the most interesting, of all political theories. Both the novel and the story belong to a group of seven novels and sixteen stories set in Le Guin’s Hainish universe. 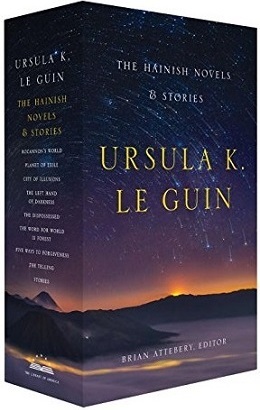 Those works have been gathered together for the first time in a two-volume Library of America edition edited by Brian Attebery with Le Guin’s cooperation. In her introduction to the first volume the author explains further how the idea of “The Day Before the Revolution” came to her. I’d wondered who the founder of that way of life, Odo, was—could I imagine my way into the head of a political philosopher, a fearless demagogue, an active revolutionary, a woman so different from myself? Only through the back door, as it were, to that mind: the way of illness, weakness, old age. Yang claims; yin shares. I could share in Odo’s being as a mortal coming to her death. Note: When Le Guin collected the essay for her story collection The Wind’s Twelve Quarters, she dedicated it to the memory of social critic and anarchist philosopher Paul Goodman, whose essay “A Young Pacifist”—a eulogy to his son killed in a mountain expedition—is a previous Story of the Week selection. The speaker’s voice was as loud as empty beer-trucks in a stone street, and the people at the meeting were jammed up close, cobblestones, that great voice booming over them. . . . If you don't see the full selection below, click here (PDF) or click here (Google Docs) to read it—free!